Opal is a hardened silica gel which is deposited at a relatively low temperature and may occur in the fissures of almost any kind of rock, being most commonly found with limonite, sandstone, rhyolite, and basalt. The word opal comes from the Latin opalus, by Greek opallios, and is from the same root as Sanskrit up�l�[s] for "stone", originally a millstone with up�r�[s] for slab. The water content is usually between three and ten percent, but can be as high as twenty percent. Be carful not to let your opals freeze or dry out either can cause your opal to crack. The Irradescence of precious opal is caused by the way the structure, a regular arrangement of tiny silica spheres, diffracts lihgt- the larger the spheres, the greater the range of colors. 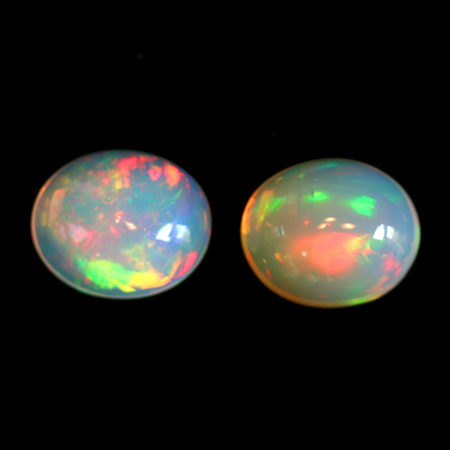 Precious opal occures in a number of color variations. Opal ranges from clear through white, gray, red, orange, yellow, green, shore, blue, magenta, rose, pink, slate, olive, brown, and black. Of these hues, the reds against black are the most rare, whereas white and greens are the most common. These color variations are a function of growth size into the red and infrared wavelengths. Common opal is truly amorphous, but precious opal does have a structural element. (see Upal).Opal is one of the mineraloids that can form or replace fossils. The resulting fossils appeal to collectors, although remain less significant for many scientists. Precious opal occures in many locals around the world. Australia, Brazil, Mexico, Czchoslovakia, U.S.A, South Africa, and Eithiopia. Opal is a bithstone of October. Beautiful multi-color matched pair. Reds, orange, yellows, and green. Excellent cut and polish dome and base. Excellent play of color. Calibrated 13x11 millimeter for easy setting.